High-speed ferry for Ouistreham departs Portsmouth at 7am. 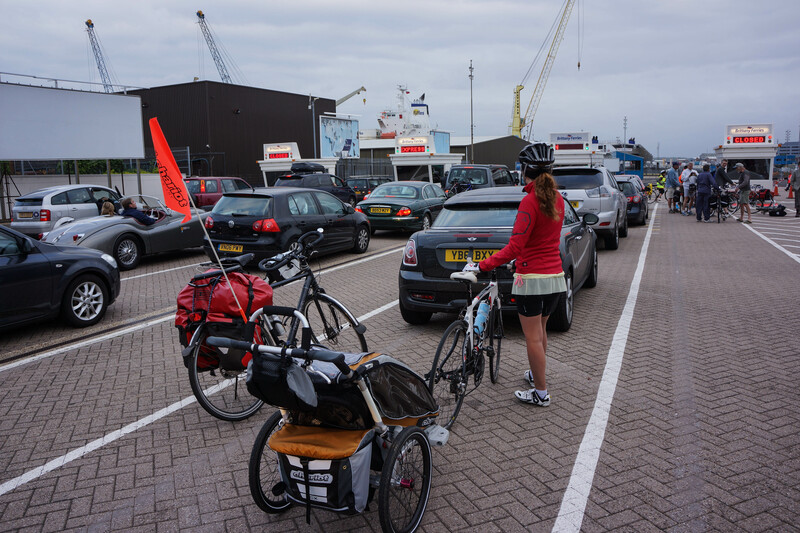 As a result, we had to wake up at 5:15am to pack, cycle 5km to the ferry and be there ready for boarding 45 minutes before departure. Dianna was very surprised to see her parents wake up before she did for once. We disembarked and took the voie verte (dedicated cycle path) along the Ouistreham – Caen canal. It is just over 17km and leads directly to the centre of Caen. 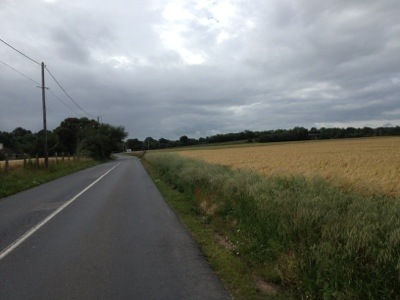 There was a strong headwind all the way to Caen and it took us more than an hour to get to our hotel. The cycleway is a dedicated path going from the port direct to Caen. It’s smooth tarmac all the way. Woke up at 6am today. We did think that Dianna will sleep a bit longer since it took 2 hours to get her to bed last night. No chance. Early bird she is, 6am sharp. We left at around 8. It takes a while to pack Dianna’s stuff (and our own), feed her breakfast, etc. She was happy to be back in her Chariot. Something we didn’t expect from her. It seems that she is enjoying this. The route to Midhurst took us through some wonderful British countryside. It is here where you start to understand that London doesn’t really represent Britain. Tourists flow into London in their thousands assuming that they are getting a taste of Britain. They aren’t. They are getting a taste of London. 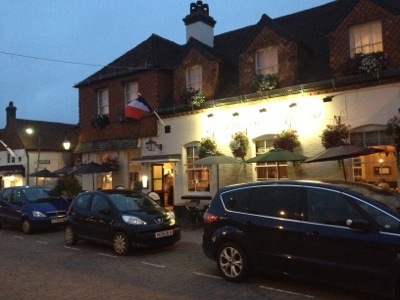 From Crainleigh we took small back roads towards Plaistow and then traversing a small ridge to Easeborne and Midhurst. Total 450 meters of climbing with some hills at 12%+. Midhurst is a lovely, picturesque village with quite a distinct character. We are staying in the Spread Eagle hotel. Nice little hotel, built in the 15th century. The weather forecast for tomorrow is not looking that good. 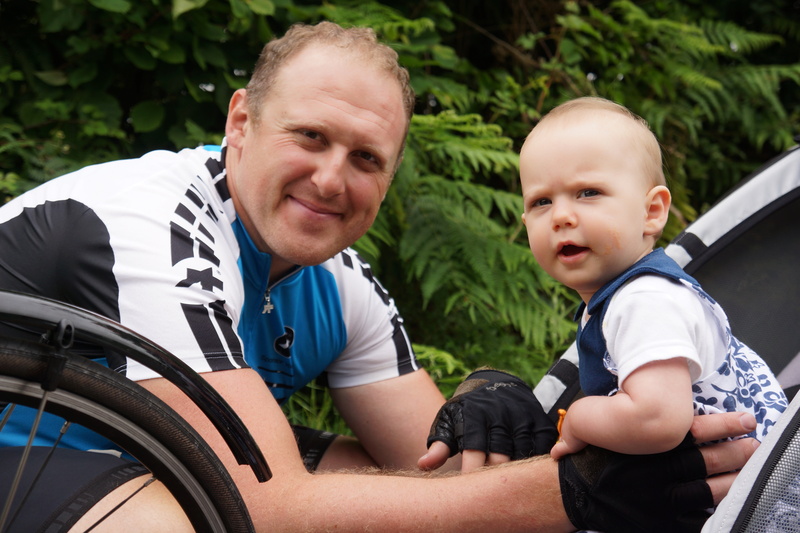 We will be going to Portsmouth, and to avoid the weather and 15km of urban cycling, we will take a train from Chichester to Portsmouth harbor. 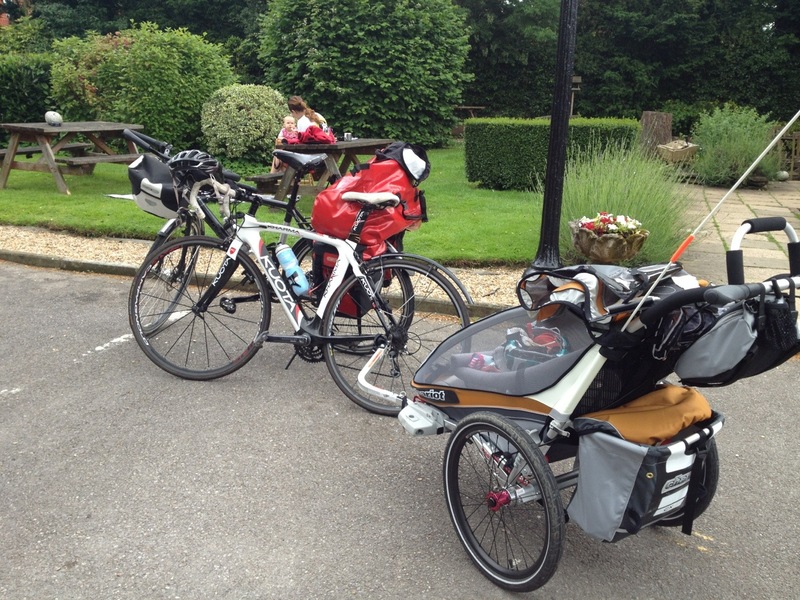 When we first came up with the idea to cycle to Nice with Dianna, we were thinking of getting a recumbent tandem – the Hase Pino. We did get the tandem, but after doing a few short tours on it, I realized that it will not do the job. It is a wonderful piece of German engineering. However, there are a few serious deficiencies in the design that make it a bit unreliable and really hard to climb with. It’s quite heavy (24 kg for the tour version), but at 12kg per rider it feels like climbing with a 30 kilo bike. Even 2-3% gradients seem like steep hills on a Pino. After carefully considering this option, we decided to ride on two separate bikes. I have a Koga touring bike equipped with a Rohloff, pannier racks, etc. 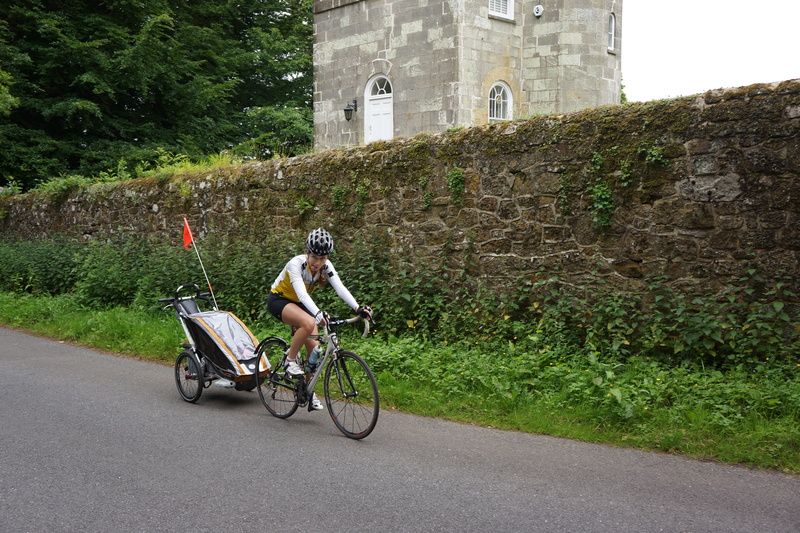 Anna will ride on her Kuota Kharma roadie, with the Chariot CX1 trailer attached to her bike. I will be carrying all of our luggage and Anna will be pulling Dianna in her trailer. We will have to equip the Kuota with SPD compatible pedals (currently Look, not the best choice for a long trip) and mudguards. 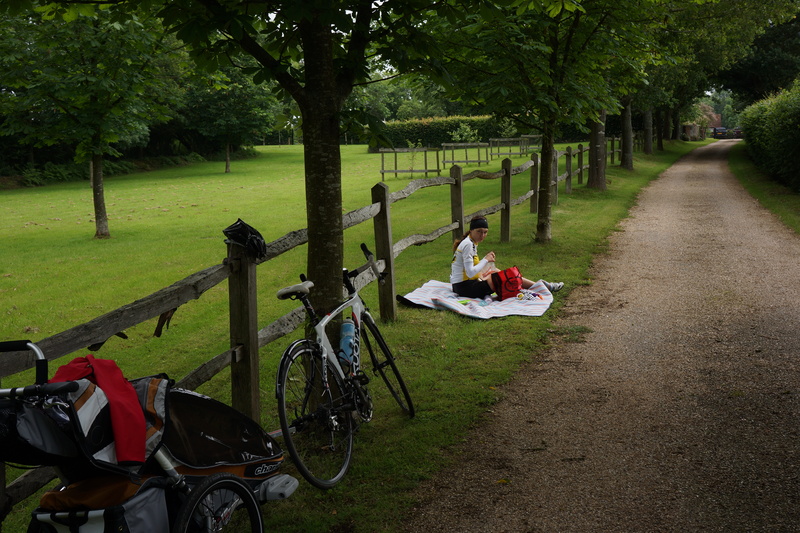 At this point, I think that we’ll have 2 Ortlieb rear pannier bags and one large Ortlieb rack pack (89l) with Dianna’s travel cot, toys, nappies, clothes, food, etc.